Despite the heroism she displayed in becoming the public face of the Trump administration’s family separation policy—which she once claimed didn’t exist—Kirstjen Nielsen, Department of Homeland Security Secretary, was unceremoniously asked to resign during a meeting with President Trump early Sunday evening. The reasoning, in part, was that she’s reportedly not hardline enough for resident White House crypt keepers Stephen Miller and John Bolton. Although Nielsen isn’t technically leaving her post until Wednesday, here’s a look back at some of Nielsen’s worst moments as DHS chief anyway. That’s not to say Nielsen didn’t enjoy fleeting moments of Trump’s approval. The Washington Post reported yesterday that one particular “atta girl” moment came when Border Patrol officers deployed tear gas on Central American migrants attempting to break through a border fence in Tijuana in 2018. In January 2018, Nielsen testified before Congress that the DHS “did not have a policy of family separation” resulting in thousands of migrant children being removed from the guardianship of their parents. It was later revealed that she signed off on an internal memo outlining a “zero tolerance” policy that called for the prosecution of every adult caught crossing the border that would result in children being taken from their parents. “DHS could also permissibly direct the separation of parents or legal guardians and minors held in immigration detention so that the parent or legal guardian can be prosecuted,” the memo read. 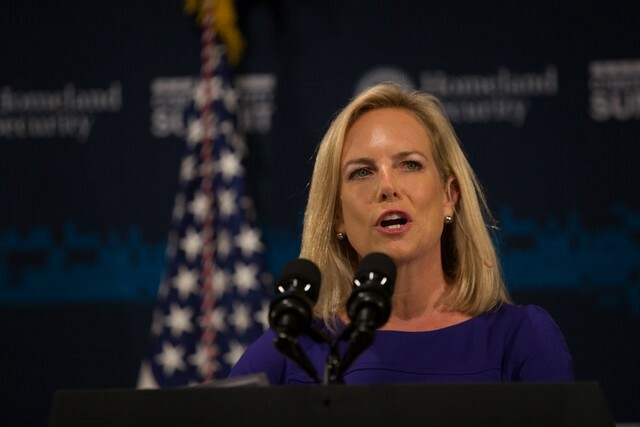 Following the death of 7-year-old Guatemalan migrant Jaklin Caal Maquin, Nielsen was unable to give a precise figure as to how many migrants seeking asylum have died while in DHS custody when asked by Rep. David Cicilline (D-RI) during a Congressional hearing in December. Rep. Cicilline: You do not know how many people have died in DHS custody? Blamed migrant child’s death while in DHS custody on her family. Had the audacity to eat at a Mexican restaurant after enacting “zero tolerance” policy against migrants crossing the Southern border. Amid the controversy over border patrol agents putting migrant children apprehended at the Southern border in cages, Nielsen felt entitled to hold a “work dinner” at MXDC Cocina Mexicana, a high end Mexican restaurant in D.C. It didn’t take long for at least 15 protestors to show up and yell at her for having the audacity to dine at a Mexican restaurant. “If kids don’t eat in peace, you don’t eat in peace,” protestors shouted at Nielsen, according to video footage captured by the Metro D.C. Democratic Socialists of America. Nielsen left shortly after her dinner was interrupted. Kirstjen, please never return to public life. Thanks!